New Santa Ana | Visit local museums for free on Museum Day! Visit local museums for free on Museum Day! The Old Courthouse Museum will be joining hundreds of museums and cultural institutions nationwide who are participating with the Smithsonian magazine in the fifth annual Museum Day, on September 26. On Museum Day you will be able to get in FREE to hundreds of museums all over the United States! Click here to see a list of the participating museums, in California. And click here to get youf FREE admission card. Docents will be on hand at the Old Courthouse Museum to share the history. The OC Archives will be open and the staff will be there to answer questions about local history and assist with research. Additionally, the museum will be screening “The American President” starting at noon. This 1995 film, starring Michael Douglass, Annette Bening, and Martin Sheen, has scenes shot at Old Courthouse. See if you can pick-out the building and some of the surrounding neighborhood! Next door, the Dr. Howe-Waffle House and Medical Museum will be open to the public and offering tours. 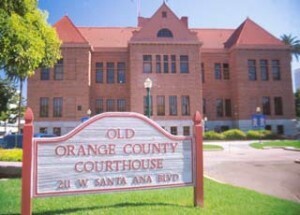 Enjoy a selction of movies either filmed at the Old Courthouse or which relate to museum exhibitions. Admission is free. All screenings begin at 12 noon. Open Houses from 10a.m. – 4:00 p.m. Sponsored by the Orange County Historical Commission. It is great to easily find information, like this link to the free passes , I didn’t have to look up old emails.